Bangalore: H.E. 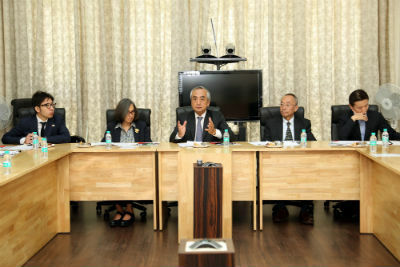 Kenji Hiramatsu, Ambassador of Japan to India, and Mr. Takayuki Kitagawa, the Consul General of Japan in Bangalore, led a delegation to the Indian Institute of Management Bangalore today to understand the goals of the newly launched India-Japan Study Centre and interacted with the faculty body of the premier management school. Explaining that he would like to focus on people-to-people exchange programmes between the two countries, especially faculty teaching Japanese language here, the Ambassador said it was a privilege to work on more collaborations with IIM Bangalore, “a place where talented students train to be global managers”. Prof. Krishna Sundar, Chairperson, India-Japan Study Centre, gave the Ambassador and his team an overview of the India-Japan Study Centre. Dwelling in detail on IIMB’s partnerships with six top universities in Japan, Prof. Krishna Sundar said support from more universities, government agencies and industry houses in Japan would certainly help in expanding and enhancing the exchange, research and industry connects that the India-Japan Study Centre at IIMB aims to build and nurture. The delegation sought details on the language training program, the student exchange program and the training program for executives. Prof. Krishna Sundar spoke of the growing number of IIMB’s students choosing country-specific programmes to Japan among other countries. “We have increased the number of students going on an exchange programme to Japan from 30 to 60 in our two-year MBA programme in the last year,” he said. Prof N.M. Aggarwal shared his experience of collaborating with Toshiba and some details about the cases that had been written in this regard. Prof. Krishna Sundar added that the high speed rail project had immense potential for case writing at IIMB, especially as IIMB’s Director Prof. G. Raghuram is a domain expert on the railways and has been sharing his views on the project in the mainstream media as well. N. Ravi, Indian Foreign Service (Retd) and Senior Fellow at IIMB, who was also instrumental in setting up the India-Japan Study Centre, also addressed the gathering. Prof. K Kumar, Chairperson, Academic Programmes, NS Raghavan Centre for Entrepreneurial Learning (NSRCEL) at IIMB, gave an overview of the incubation and mentoring activities of NSRCEL. Prof. G Shainesh, faculty from the Marketing area, sought to know what would be done to increase the number of Indians visiting Japan. IIMB’s Deans Shainesh G and M.S. Narasimhan, and faculty members Subhashis Gupta, Haritha Saranga, Ishwar Murthy, Jayadev M, Nishant Kumar Verma and Rajeev Tripathi were present during the interaction. Shobha R Kaveri, from IIMB Management Review, IIMB’s practitioner journal, proposed the vote of thanks in Japanese much to the delight of the visitors.